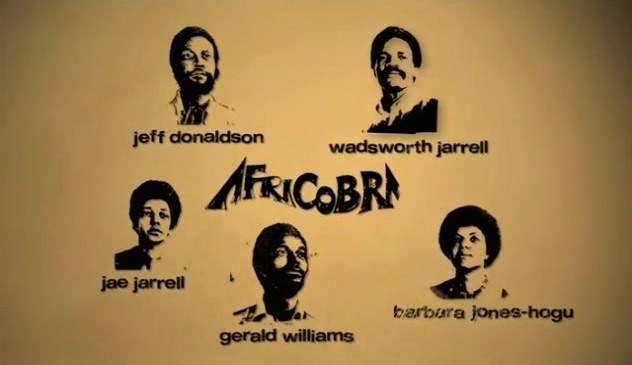 Jae and Wadsworth Jarrell joined with three other artists as founding members of AFRICOBRA in 1968. Wadsworth had moved to Chicago from Georgia, and Jae from Cleveland, both to study at the School of the Art Institute of Chicago. After Chicago, their family moved on to other cities. Wadsworth taught painting at Howard University and the University of Georgia and developed his practice as a painter, exhibiting his paintings widely. Jae is not only an artist, but also a dealer in vintage clothing, who had shops in Chicago and in TriBeCa, New York City, and supplies period costume for TV and film productions. They now live in Cleveland, where their work continues: Wadsworth as a painter and Jae as a sculptor using reclaimed furniture as her medium. Rebecca Zorach (RZ): I wanted to start by asking about the theme of the Black Family, and the Black Family exhibition, the first theme that AFRICOBRA chose. I wanted to ask you about this in part because you were a family at that point. So I’m curious about how that theme was chosen, and what it meant to the two of you personally, and in the broader sense, what it meant socially and politically. Jae Jarrell (JJ): Well, AFRICOBRA chose a subject that would be a positive image to relate to people, give direction, and make a powerful statement. It was decided that the Black Family would be that first strong image to impress the people. Wadsworth and I were married, with a family started; so it was a particularly meaningful project for us to portray something that we believed in so much. And we made a pledge at the beginning of AFRICOBRA. It was really revolutionary times, when people did a lot of demonstrations, took time out from their personal lives to go out and do demonstrations for the community. We pledged to take care of business in our house, with our family first, and whatever time we have left, we would put in our artwork. And make that the statement and the demonstration. So we, we really did assume the ideal black family posture, no matter how much involved we were with our art, and with the revolution, that it was important to build a loving environment at home, that would pay off in the end. And, we’re really proud of the results of that effort. Our family is made up of powerful people, and we’re all tight. RZ: Would you talk a little about the ideas behind the formation of AFRICOBRA as a group, and how the group came together and then continued to work together? Wadsworth Jarrell (WJ): We came together as a result of the Wall of Respect. This was the first group project that, possibly, any of the artists had worked on. So, we saw a need to go further because the OBAC artists that worked on the Wall of Respect were a loosely formed group. We decided that we would form a group that had more togetherness. We formed a philosophy that spoke of working towards creating a new language and a school of thought. The purpose was, to create art that had a political slant that also included an aesthetic. Most of the art during the sixties was labeled as protest art, especially art of African-Americans. We escaped that label because we focused on our heritage instead of protesting injustice meted out by mainstream America. We weren’t just a group of enthusiastic artists, making art. A lot of art made during that period had little or no aesthetic qualities, and by artists with limited skills. We were all skillful artists, and our aim was to make an impression as a Revolutionary group by creating an African-American aesthetic. RZ: Going to go back to Jae’s response to the previous question, I’m thinking of that 1960s phrase, “the personal is political.” It seems like there was political component to the personal relationships, and a personal component to the politics. That it was important to come together as a group. To phrase it as a question: what was important about coming together as a group as opposed to each artist pursuing his or her own individual career? JJ: The power that you create with several voices, it’s a chorus. And you know you’ve heard it. The thing that AFRICOBRA achieved was in setting up a philosophy of positive imagery, and just good direction for young people, for neighborhoods, for the community. Artists have always been leaders in any of the eras they’ve been in, particularly because they normally present something that has not been presented. So therefore, it’s eye-catching, thought-provoking, and we were used to that kind of contribution of artists, but then we wanted to make it more powerful. The unity in our voice, what it does is it behaves very much like a jazz concert, where one person solos and somebody ups him, and you’re all building the grid. And it’s, when you saw an AFRICOBRA show, even if each person had only one piece, and that wasn’t generally the case, but when we first made Black Family, we all had one item, which was the first, and that was the jump-off item. Because it was what we needed, we had talked, philosophized for so long, and then we said, we need to articulate this into our work now and produce some work. What can we do? And, out of our putting our heads together, we thought of positive imagery; one thing we need to push for is the whole family, to make that an image that people embrace. And so, when you saw our black families together it was a community within a room, just like that, and it had a very powerful impact. And that’s, that’s something that is an advantage of working in a group, and having honed our own language—what we want, directing you what to see, not leaving ourselves, our work, at the mercies of the critics, to interpret. We clearly wrote on the canvases and garments and tapestries, exactly what we wanted you to know, and say. And that can be a hindrance in a way, because critics are held to the posture that we set forth, but nonetheless, it holds true. You see the stuff later; you can’t read anything into it but what’s in it. And I think it’s strong. RZ: I wondered, actually, about that because sometimes it seems like some of the lettering is easier to make out than in other examples. And, so I wondered sometimes if there were actually hidden messages: if you look really carefully, you eventually would get it, but you’d have to look really carefully to figure out what was going on. Was that an intentional aspect of some of the lettering? WJ: Each artist had his or her own way of presenting the lettering, resolving their lettering into the artwork. That was part of our principles: introducing statements into the art. So each person had a different way, a different approach. Some of the artists’ approaches were easier to read, some of Gerald Williams’s and Barbara Jones were probably easier to read than others. Jae’s was easier to read because she didn’t have a lot of other stuff going on in the background as a painting would have. Mine was more discreet, it was harder to decipher. You had to concentrate in order for the lettering to pop out. Sometimes I forget there are statements in my paintings. I was looking at this painting Liberation Soldiers the other day, and I forgot there were statements, bold ones, in it. That’s an individual kind of approach to resolving lettering, and a way to co-opt it into the total composition. RZ: But it is kind of requiring the viewer to engage in a different way with those works where it takes a little longer to figure it out. WJ: Right, and some viewers never see it, you know. If you see a show, you might not ever see some of the lettering and statements that’s in the art. RZ: I’m wondering about whether you can think of examples of particular moments or particular people you saw really being affected by your work or other AFRICOBRA work. I’m just thinking about the desire to use art to forge revolutionary consciousness, or to change people or to make them think differently. Can you think of examples where you kind of saw it in someone’s face, or you saw it in their actions? JJ: There was a lot of joy, just, outward joy. I remember the first AFRICOBRA opening, it was certainly a celebration, and it really caused people to rejoice. First of all, we required that museums and galleries that showed our work paint their walls in coolade colors. That was just phenomenal. So, they took a lot of pride in having purple walls. They really stretched out. And it, it made ours so much fresher than other presentations. Also energizing, that this was an era when musicians might perform during the opening, just to be there for us, poets as well. And that was always fun. When we opened at The Studio Museum, there was a group of performance artists. JJ: The opening drew a huge crowd, and the performers were intermingled in the crowd, when all of a sudden, their voices started a vocal drum-beat, a simple roll. They were scattered throughout the room. So we could each experience that cadence in our chests. “Boom. Boom. Boom.” and then they began to speak, and to weave among us messages of the time. It was a huge number of artists that were there, celebrating us, and it was so right, it was so perfect, and I could tell that we had really, really energized them. And that kind of exchange happened in those times. RZ: Do you know what the group was? WJ: I think it was the Harlem Theater, I asked Ed Spriggs not too long ago, and that’s who we think they were. JJ: They weren’t far from Fifth Avenue, near 125th, where The Studio Museum was then, and I think they were located near there. That was a mecca of art in that area. 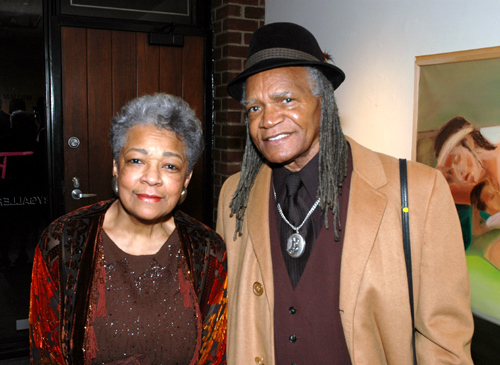 WJ: Our influence was wide, we influenced artists of all colors, and possibly still do. JJ: There was something else interesting, I think, regarding influence. We made an effort to raise a consciousness. In our hearts when we put this all together we thought it was going to be an explosion of positive imagery, and things that gave kids direction, and knowing some of our leaders now portrayed in a fresh way. I saw a result of our raising the consciousness, particularly about our history. I saw something that I thought was, sort of, a backward response, because I saw artists look at our history, but instead of being energized, to develop on it, they went whole hog into portraying it. So they went back. And then of course some of that might have been embraced because that history had not been seen or portrayed by modern artists. So, then they feel like they’ve hit it, so they stay in the Thirties. You know, they stay at the church with the family and the whole bit. You know, that’s cool, but the point is I saw they jumped into history, and then some of them even reached back to telling the whole story; so they have the Ku Klux Klan portrayed. That was when I thought, “what is this? This is reverse.” I never would have guessed this reaction from artists, yet I saw a lot of that when we held people accountable for our history. Read it, get energized by it, and take it forward, in my estimation. And that’s where AFRICOBRA’s head was. Always forward. Always in the new, and opening a new direction and powerful expressions that made you think, “oh yeah, I can do this.” But I saw a lot of artists who made, who—saw the importance of portraying where we had been, a lot. JJ: Many still do it, because they got over on it. WJ: Some artists can’t get past the Middle Passage. JJ: And the thing that really disturbs me in this is, because this becomes a racially conscious thing that I’m concerned about. It is much easier, and more comfortable, for the “powers that be” in the art world, to embrace this negativity, and raise it. And you’re not telling the young people, “you can be who you want to be.” You know, I was very sorry that that seemed to be a trend. You see, black artists who’re celebrated, oftentimes, they can’t get out of the thirties. WJ: That was the difference between AFRICOBRA and other African-American artists. AFRICOBRA wasn’t about race at all, we were about heritage, and that is the difference. We were not about protest, it wasn’t about any of that kind of stuff, it wasn’t about the Ku Klux Klan, and pointing out look what they did to us. We were moving forward. We were showing the positive area of our heritage, you know, that’s where we were. That’s where we went. RZ: So you thought about looking to history for models for the future, as opposed to looking to it as something to dwell on, for its own sake? JJ: My reference to the history is all the way back to the Continent, you know, because this made us more familiar with who we were. And you sort of skipped over just the American experience, because that’s something else. Where we felt empowered is when we began to study our African heritage, out of our own curiosity; and at some point more formal courses as we had the opportunities to take them. We began to see the sophistication in African sculpture. It made you chuckle, it was so beyond anything modern. I mean, it was more modern than modern. And still to this day, it is a classic. And so we saw that kind of power and were energized by getting to know what many of our ancestors did. And, I don’t think we ever made references to oppressive segregation or things of that sort. JJ: We just didn’t go there. The point is, if you bring it to people’s attention, then that raises it. You only have a fleeting moment to view a piece and to take away something. So Lord, please give it something that has a positive impact. Negativity, don’t deal with it and get past it. WJ: What AFRICOBRA was bringing to the world was the fact that African-Americans’ life didn’t begin with slavery. We existed long before America existed. That was the point. RZ: So, how would you contrast the themes and messages of AFRICOBRA with something like the Wall of Respect, which obviously AFRICOBRA had a relationship to—many of the members had been involved in the Wall of Respect. Because that was historical, not dwelling on the negative, it’s positive images too, but it’s definitely about history, right? And African-Americans. WJ: Yeah, it was. Yeah, all of the images were African-Americans, and mostly it was dealing with people in the Civil Rights Movement. We were showing the images that had a more of a militant stance, than other people in the movement. Those were the images that we chose to put on the Wall. A lot of the musicians didn’t take a political stand; they were just musicians. The political end of the Wall of Respect was basically the politicians, I mean, the “Statesmen” section, that was the most political part of the Wall of Respect. That included Adam Clayton Powell, Malcolm X, Stokely Carmichael, Rap Brown, and Marcus Garvey. RZ: I’m wondering also about the specific setting of Chicago, whether it’s Chicago politics, or anything about the black community in Chicago, or different communities in Chicago, how that played into AFRICOBRA? Obviously AFRICOBRA went on beyond Chicago, but are there things that you think of as specifically Chicago about that early formation of AFRICOBRA? JJ: I would say that the beauty was that we were well trained artists, and there was forward enough thinking in Chicago—it’s a sort of a “yes you can” kind of place. Chicago’s political system makes a way for people. And it’s one of the only major cities that I knew at that time and even to this day has the number of black businesses that are really strong, and have roots in the community. A way has been made through that political structure that have many other ethnic groups with strength in their communities­–a strong kind of place to nurture some new heights. And there were a number of artists that trained there and there were good schools there, particularly the Art Institute. And it was good to be able to get together with this group of artists and feel confident in what you bring to the group, share a philosophy yet keep an identity, and ultimately make a collective contribution to the community and to mankind. I think that’s something that might not have happened in some other, even major, city. WJ: I think that is what so Chicago about it, you know. Chicago is the city of the big shoulders, to quote the poet, Carl Sandburg. In New York, African American artists were picketing the Whitney and the Metropolitan Museums, to include black artists into the African-American shows they curated, and petitioned the museums to integrate their curatorial staff. In Chicago, AFRICOBRA was about working collectively and creating an African American aesthetic. We weren’t trying to get in any shows. We were trying not to get into any museums or galleries. As a matter of fact, we would refuse to exhibit in a lot of places. So, we were about a whole different thing than some artists in New York. RZ: Was that about creating separate spaces? I’m curious about why you were turning down shows and institutions. You felt like you didn’t need them in order to do the work that you were doing? WJ: In keeping with our philosophy from its inception, we decided we would only show in black institutions or institutions run by black people. We turned down a show in Paris for that reason, the Musée d’Art Moderne de la Ville de Paris, and that was pretty huge. And some people said that was a mistake, but I don’t regret it today. You never know what happens, and nothing could have happened. That’s one of the major places we turned down, we turned down a place in Germany, and also in America, so that was our philosophy, and we stuck to what we believed in. We didn’t need the mainstream to okay our art. You know, we didn’t need their stamp of approval. RZ: Were there a lot of black-owned and black-run venues in Chicago in those years? WJ: Well, Chicago only had South Side Community Art Center, and a handful of galleries owned and operated by African Americans, similar to our gallery at WJ Studios, but these were small places that were not open that long. There was the Afam Gallery, there were several other little places, but the largest place was the South Side Community Art Center. We didn’t show there until later. JJ: AFRICOBRA went on the road, from the beginning. The very first show being in the Studio Museum in Harlem. And then offers elsewhere, I think CONFABA (Conference on Fundamental Aspects of Black Art) might have been helpful to us, which was held in Chicago. It was a conference of art institutions, art historians, and other principal artists, and we hosted them at WJ Studios, and all of AFRICOBRA was there. And that’s where we sort of let them know who we were, and they were very interested, and they said, keep in touch, let’s see if we can help you. I guess an itinerary for the first show, AFRICOBRA I and II, and III, came out of the contacts from that group. So it took us on tours through upstate New York. WJ: Yeah, we traveled a whole year in upstate New York. JJ: Yeah. And so we didn’t, we weren’t counting on the local. We were making a statement that we thought was countrywide and worldwide. And I will never know who it was, but I did a lot of the publicity for AFRICOBRA, and for our first show, there were journalists and photographers that came from Europe, it was amazing. I will never forget AFRICOBRA I, when we opened, there was a little bitty short man who was from Paris who was a photographer who knew how to leap past an entire crowd to get the whole spirit of that opening. It was just wonderful. I mean, the sky’s the limit if you shoot for it. So we went past home. WJ: We did participate in white institutions that curated African-American shows. Like the Herbert Johnson Museum of Art in Ithaca, NY had a huge show sponsored by Carnation Milk, and they published a thick catalogue. That show included artists from all over the country, and only a few AFRICOBRA members participated. 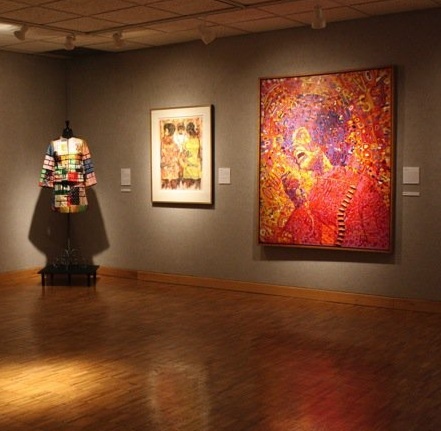 Our works were not hung as a group at the Johnson Museum; they were interspersed throughout the show. But our works were hung as a unit in Africa, when we participated in FESTAC (2nd World Black and African Festival of Arts and Culture). I just found out a few weeks ago the reason our work was hung together. Arthur Monroe was in charge of hanging the show, and Gerald Williams happened to come by, and he had AFRICOBRA interspersed throughout the show, so he insisted that AFRICOBRA should be hung as a unit. RZ: So the one where you were together was in Lagos, that was Nigeria? WJ: Yeah, that was FESTAC, ’77. RZ: Okay. Just to go back to Chicago for a moment, you mentioned the Afam gallery. Who ran that? RZ: And was he also involved in the South Side Community Arts Center? WJ: Yes, as a matter of fact he was the director of it for a moment. He’s also a musician and a printmaker. His trio played at art openings, at Afam, the WJ Studios and Gallery, and the South Side Community Art Center. Actually, lots of times you’d go to hear him play more than you would to see the artwork. RZ: And when you first got the building for WJ Studios, were you thinking of it as a personal studio and not as a gallery? Or were you always thinking of it, from the very beginning, with the possibility of having a gallery? WJ: No, I moved into that studio alone, I was interested in a live-work place. Before I moved into the studio, I was living with a family that had a six-room co-op. I was renting a bedroom, but had the run of the whole house. Matter of fact, the owner of the condo insisted that I come out in the living room and paint. The place had wall-to-wall carpeting, so I had to spread down plastic because I was working in oils then, and at any minute I might have an accident and knock over turpentine filled with paint. So, anyway, I worked out in the living room. I was glad to get away from there and find a space. Fred Jones lived in front of the space, and he told me about it. We were in an art fair in Hyde Park and he told me about a studio for rent. He embellished it, he said that “the studio is as big as this space, all out here!” It wasn’t quite that big, but it was large, you know. So anyway I went over the next day and rented it. Using it as a gallery never entered my mind because I don’t believe in vanity galleries, I don’t believe in an artist-run gallery. I was just looking for a place large enough to live and work in, you know? And I got it cheap, that was one reason for renting it. It all just developed later when Jae and I got married, it became AFRICOBRA’s headquarters. All of those events took place after Jae and I were married. We decided to turn the first floor into a gallery, the space that I used to park my cars in early on. There was a drain in the middle of the concrete floor, it was built like a coach house, but it was a studio, it was built for the purpose of being a studio by a sculptor to work on a mammoth piece for the Columbian Exhibition; the World’s Fair, in 1893. The studio consisted of two bays, that was 30 x 30 square feet, two stories tall. I was just glad to have a space to work and live in, you know, and at my price, so it was great. RZ: And when you did start to use it as a gallery space, how many shows did you have, do you remember? Were there a lot, or was it infrequent? WJ: We had some all together, a bunch of them together, and then we might wait a while before we had another. But we had quite a few shows. When I was in New York in the 2000’s, somebody was telling me and there was also an article in the New York Times about galleries on the Lower East Side where they had poets and musicians opening art shows. And I said, wow, we were doing that in the sixties at WJ Studios and Gallery in Chicago. The AACM, who was local at that time, but now they are world-famous, would play at our openings for us, we also had poets, well-known poets who would do readings and open up shows. JJ: The AACM did concerts there also. WJ: Yeah, that’s right, they would do concerts on Sundays, and we would charge admission to come in. RZ: And you’d get a good crowd? JJ: Same art crowd that was at the Afam and all the other noted places. WJ: Yeah, it seemed like the art openings drew bigger crowds than AACM did. We even drew the art critic from the Tribune, what was his name, Haydon? WJ: Harold Haydon, yeah. I didn’t realize he was an artist at the time, I just read it later, where he was an artist. He would come out to the openings, which was good. RZ: And then would he write it up? WJ: Yeah, he would write it up. RZ: I have a question about COBRA, before it was AFRICOBRA. JJ: Yeah, it was Coalition Of Black Revolutionary Artists. WJ: Same philosophy, same people. We decided to put “African” after COBRA and we became AFRICAN COBRA, and later we became AFRICOBRA (African Commune of Bad Relevant Artists). RZ: There was a conference at Columbia College, called The Arts and the Inner City, that some COBRA members went to, and there was a controversy at the conference because Columbia College had organized it and they hadn’t included very many black artists from Chicago. Jeff Donaldson was there, but most of the other people were not visual artists. At least in the newspaper articles, it seems that COBRA was a name that more people were using than just those of you who ended up being AFRICOBRA. WJ: That group was led by Jeff Donaldson. It was a quickly formed thing they did to protest that conference. I wasn’t in it, I didn’t even really know about it. I saw these illustrations of Jeff in the paper. They had some really nice drawings of him. So, when we started meeting, Jeff said that we could use the name COBRA for our group, so we did. The group that staged the protest at Columbia College was a mixture of theater people, poets, musicians and photographers. RZ: So, to wrap up, maybe you could talk just a little bit about what you took with you from your Chicago experience when you moved on? You then moved to a number of different places and had a lot of other experiences and your art evolved in different ways. What would you say each of you carried with you, from Chicago AFRICOBRA? JJ: The most significant relocation for me after Chicago was Washington, DC, where I completed my B.F.A. Degree, and also did graduate work at Howard University, with a focus on textile design. Though I painted images and statements in acrylics on four garments that I presented in AFRICOBRA I, and three in AFRICOBRA II, the introduction to sculpture, African art history, and printmaking made a profound impact that has been reflected in my work from that point on. My textile designs were done predominantly on leather and suede skins, which I tie-dyed, screen printed, hand painted and appliquéd. With many of those expressions, I constructed vests, reflective of African masks, that I called jewely jackets–my quick fix production allowing mama, wife and designer to prevail simultaneously. My embrace of heritage drew me to African sculpture that directed me to a structural approach to fashion designs, and ultimately assemblages. Positivity is important to my art. That’s an AFRICOBRA trait that I often couple with humor. Laughing’s a good thing. This relief [indicating an artwork in the room] combines an ensemble, my love for sculpture, and celebrate my retirement from solely being a designer of clothing. I have moved on to broaden my expressions. In fact, I now design and construct furniture. RZ: What’s the title of this piece? JJ: The rather important last show I had, presented a line of suits and coats, my forte. This ensemble encompassed signature moves of which I am most proud–uncharted drape, refreshing accessory design, fine finishing, with style-setting coordination. So, to celebrate one era of expression and yet embark on the next, I impaled it in “Frock You,” and that was the end, yet the beginning of that. I did not coin that. At my shop in the ’60s in Chicago, a wordsmith friend of mine devised the expression to hang on the door whenever I called it quits. It was too clever to waste. I saved it some thirty or so years, so that’s what that is. WJ: I took from Chicago some of the confidence and swagger that you get in Chicago. Everywhere I go, all of the other cities that I have lived in, I was never really overwhelmed by the city, because I had lived in Chicago. Actually you could compare all of the cities that I have lived in, some had good points, but I found out that Chicago has great points that stuck with me. When we moved to New York, which is altogether different, there’s no city like New York City, but still there’s some things about Chicago that were infectious. Chicago is where I learned discipline. When I was single I would be working on Saturday nights, Friday nights, and I remember my friends coming by, sometimes they’d bring their girlfriend by, asking me to go out, and the girlfriend would ask me, “what are you doing working here on a Saturday night?” You know, when everybody’s out partying. I remember a time when my brother brought a bunch of people by my studio, he called me up to borrow some money, and he had this car full of women, him and two other guys. I had just bought a convertible Corvette, and it was parked inside the house downstairs. So I was preparing for a show that I had to take up to Michigan. everyone was asking me, “what are you doing with this big pretty car downstairs and you’re here painting?” I had learned discipline, that’s what I carried everywhere I went. When I work on my art, I take it as if it’s a job, That’s one thing that I learned in Chicago. I was working in commercial art, seven and a half hours a day, and I would go home and work from four to six hours at night. Because I told myself that if I can work seven and a half hours on a job, doing something I don’t want to do, I certainly can come home and work six hours doing something that I want to do, for myself. RZ: And how about AFRICOBRA, and what it meant for your career beyond Chicago and beyond AFRICOBRA? WJ: Well, once you joined AFRICOBRA you were in for life, whether you left it or not, because it’s infectious, you know. And it had such a positive effect on an artist. It changed your way of thinking, it changed your way of working, your whole outlook. And those things would never leave you, even though you might change the way you work. But there will still be some of the AFRICOBRA influence in the work. Even with the work I’m doing today, there’s still some AFRICOBRA influence in it, even though it might enter subconsciously. AFRICOBRA influence never leaves. It became part of you, like breathing. JJ: It’s like a family, you know, you could never divorce yourself from the family. You can only grow, and you could always understand those who have not moved in the same kind of direction you have, but there’s a language you have, and an eye contact and a trust and a respect. It goes a long way.